Middletown Firefighters recently performed training scenarios in the vacant Manchester Inn. 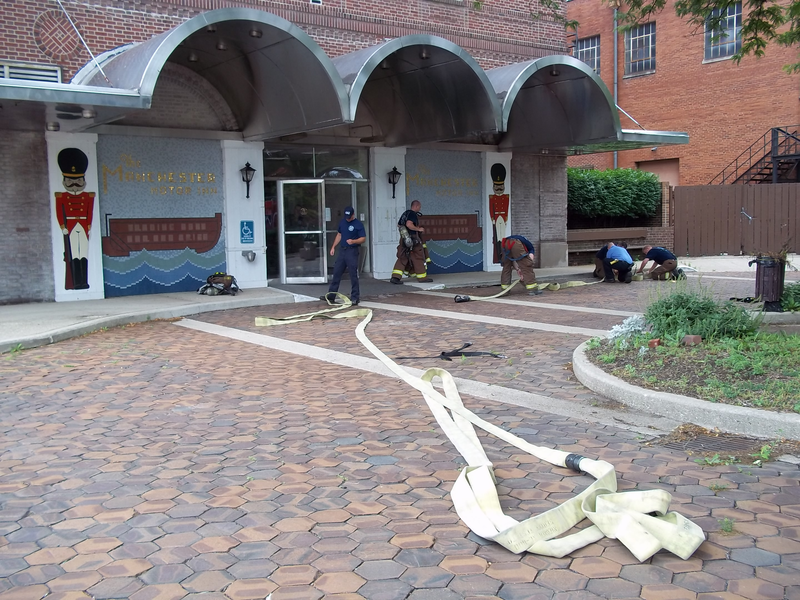 The building proved to be a perfect fit for practicing hose deployment and water supply in a high-rise building. Fire personnel used skills and techniques borrowed from the Denver Colorado Fire department. The methods were brought back by members of MDF who recently attended training in Cincinnati featuring Deputy Chief Dave McGrail (Denver). Fires occurring in high-rise buildings are particularly dangerous to occupants and firefighters. The training program was centered on the deployment and proper use of "high-rise packs". The packs are comprised of 2 1/2" fire hose assembled in a tight bundle, which are carried to a point near the fire. Once inside the building, the hose is connected to the large piping in the stairwell, designated for Fire suppression.